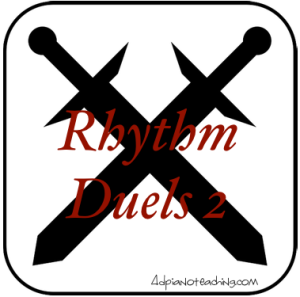 So remember that post we did a long time ago titled “Rhythm Duels“? Well it’s been our highest rated pin and favorite page for many music teachers of all instruments so we decided to share a few more today. Something for those intermediate students at their next group class. As we start gearing up for state theory tests, this is a great way for my students to prepare as well. Remember our ideas to mix up the simple competition? Here they are again just to remind you how fun this game can be when you keep changing it up on the kids! Ritardando – slowing down to the end, sounds easy but doing this with another person can be a bit tricky! Or maybe it’s in the middle of the piece with “a tempo” on the next measure?! Forte/Piano – why not mix in some dynamic practice?! Let students who are listening write in their choices for dynamics (try laminating copies so you can use white board markers and erasers). Boomwhackers – seriously, who doesn’t love to play on these? What a fun activity! This could also be a fun home challenge (and maybe a bit trickier) by adding a backing track. Jim Dooley has various styles and tempos on youtube that I sometimes use in place of the metronome with scales. I’ve never even heard of Jim Dooley’s backing options – thanks! I’ll have to check them out.